One of our most popular models, the RO-200 Series is a compact, energy-efficient Reverse Osmosis System designed ideally for tap or brackish applications. Our smaller systems are capable of reaching incredibly high recovery rates. Reverse osmosis machines are tasked with purifying water from water sources such as lakes, rivers, well, and even the sea. These machines utilize a high pressure pump that pressurizes brackish or sea water against the surface of a semi-permeable membrane containing small pores. Water molecules are only permitted to flow through the small pores while blocking impurities such as salt, particles, minerals, and other organics from passing through. These small pores have a strong capability of rejecting bacteria and disease-causing pathogens. At the end of this process, clean, purified water emerges on the lower-pressured side while salts, minerals, and other organics are thrown into the brine stream then into a drain. 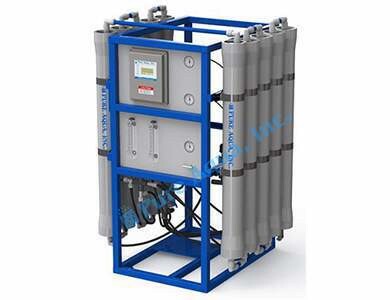 Our RO-200 series commercial reverse osmosis units are manufactured to meet important matters such as robust construction, user friendly, environmental friendly and long term reliability.